In the heart of the Lake District there is a place like no other. Far from the boats of Lake Windermere and the holiday makers searching for Peter Rabbit, lies Ullswater. It looks untouched by history, prehistoric perhaps and so very beautiful. There on it’s southern bank you will find Dobbin Wood, and it’s a place that one day I hope you can visit. Trees of every type seem to clamour for your attention, as you choose one of the woodland paths to explore. As you venture further into Dobbin Wood, every rustle of the trees and call of the many birds, hasten you towards your unseen destination. Until that breathtaking moment when the trees part and there before you lies the shores of Ullswater. As I stood looking across the lake that day, shivering just a little, the inspiration for this design was born. 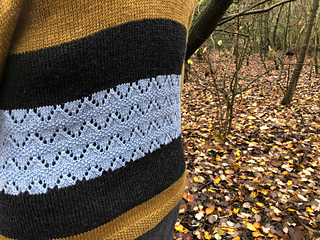 Dobbinwood is the wrap that would have kept me warm that day, and I know it will keep you cosy and warm on all of your woodland adventures. 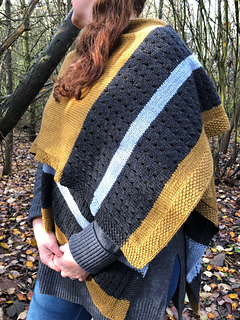 Dobbinwood is a Ruana style wrap, worked in one piece. You begin at the bottom edge of the back and work up to the divide for the fronts. You then split for the fronts, putting stitches for one front on hold while you work the other. You then go back and pick up these held stitches, working the second front in the same manner as the first. 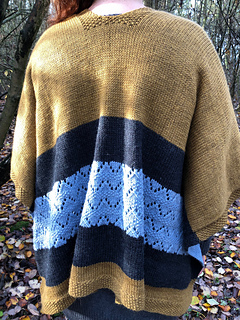 The lace panel on the back represents the craggy peaks of the Lake District, whilst the eyelets on the fronts reflect the heavy raindrops that you so often see there ! 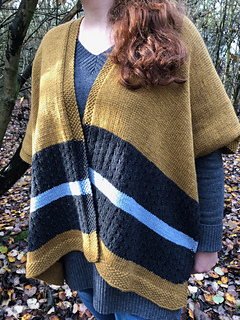 If you choose to use the same yarn as my sample, you will need 4 skeins of the main colour, 2 skeins of contrast colour 1 and 1 skein of contrast colour 2. The yarn has 250m per 100g. 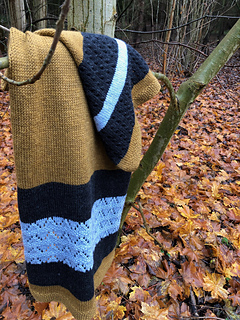 The finished wrap is 51 inches (130cm) long and 40 inches (102cm wide). 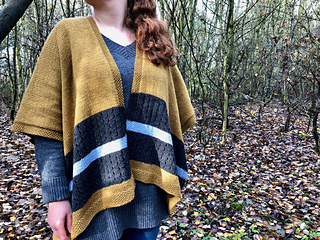 This is a relaxing project, ideal for adventurous beginners. The lace panels are both written and charted and the pattern contains a hand drawn schematic.